Jenna-Louise Coleman Will Stay On For ‘Doctor Who’ Season 8. 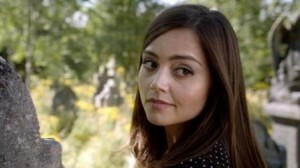 Coleman confirms that Clara Oswin Oswald isn’t going away anytime soon. Given that Clara Oswin Oswald has already died twice on “Doctor Who,” no one can guarantee that her third incarnation won’t meet a similar fate. But that doesn’t mean that Clara’s portrayer, Jenna-Louise Coleman won’t be around for this season and beyond. During an interview with BBC Radio 5 (via Radio Times) Coleman noted that “I can say I will be in season eight.” Coleman also said that production of “Doctor Who” Season 8 won’t even begin until September, because her co-star, Matt Smith will be away filming How To Catch A Monster, the directorial debut of Ryan Gosling. “Doctor Who” Season 7 will resume on Saturday, March 30 on BBC America and BBC One.